A head on crash Edgell Road and Central Street in Framingham. 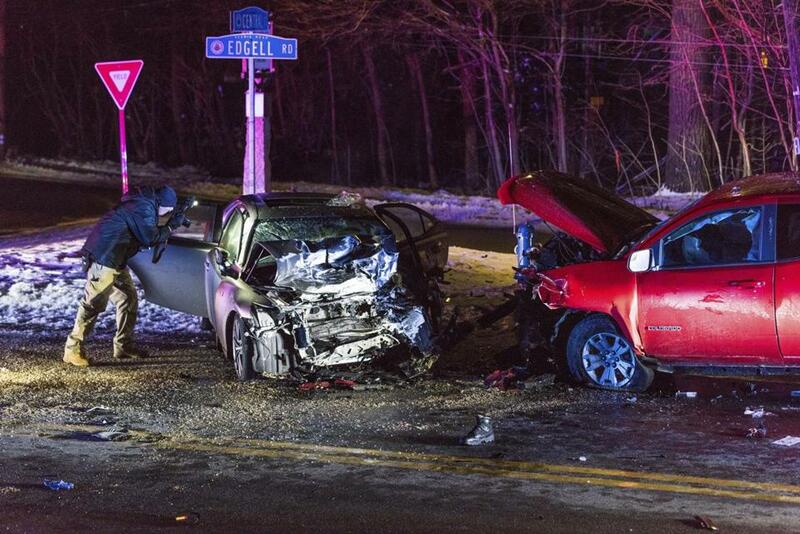 A Framingham police officer and three Framingham State University students were injured early Friday in a head-on collision while the officer was responding to an out-of-control house party attended by Framingham State students, officials said. The head-on crash took place around midnight near the intersection of Edgell Road and Central Street, according to a statement released by the city’s public information officer, Nichol Figueiredo. The crash mangled both vehicles, and Framingham firefighters had to extricate the victims. Both the officer, who was driving alone, and the operator of the other vehicle were rushed to UMass Medical Center in Worcester by helicopter. By Friday afternoon, officials said the police officer and the student were both expected to recover. The second student, who was less seriously injured, was also taken to UMass Medical, officials said. At the time of the crash, all on-duty Framingham police officers, as well as state troopers and officers from Sudbury, Natick, Ashland, and Sherborn, were rushing to Brook Street, where a house party attended by some 200 people was ongoing. A neighbor, who requested anonymity for privacy reasons, said the street was clogged with people and police cruisers. According to a statement issued by Framingham State, a large number of students attended the party. Students might face discipline by the university because “the student code of conduct at Framingham State extends beyond . . . campus.’’ The school will consult with Framingham police about the student involvement in the house party. As the partygoers were ordered to leave by police, “multiple altercations” broke out, leading the first arriving officers to call for backup, officials said. And a few moments later came a second request for more assistance. Police arrested two men at the party, including the person who allegedly rented the home and hosted the party. Keith Worthy Jr., 21, of Springfield was charged with keeping a noisy and disorderly house, assault and battery on a police officer, and resisting arrest. Worthy has taken courses at Framingham State but is not a registered student, the school said. A second man, Devante Santiago, 23, of Hyde Park was charged with disorderly conduct. He has no known connection to the school, the university said. Both men were to be arraigned in Framingham District Court Friday. They were released on personal recognizance and ordered to stay away from the Brook Street residence, according to the Middlesex district attorney’s office. Worthy and Santiago are due back in court March 16, prosecutors said. The crash is under investigation by the State Police crash reconstruction unit. The house party is under investigation by Framingham police. John R. Ellement can be reached at ellement @globe.com. Follow him on Twitter @JREbosglobe. Elise Takahama can be reached at elise.takahama@globe.com.Follow her on Twitter @elisetakahama.